Every two years since 2008 the Arizona Commission on the Arts and Arizona Department of Education have planned and co-presented the Joint Arts Education Conference (JAEC), a day of professional development for teaching artists, arts educators, school administrators, and others working with young people in the arts. For JAEC 2018, the organizers endeavored to demonstrate the principles of the conference’s central theme: Creative Youth Development (CYD), a recent term for a longstanding theory of practice that integrates creative skill-building, inquiry, and expression with positive youth development principles, fueling young people’s imaginations and building critical learning and life skills. In other words, they placed young people in the lead. 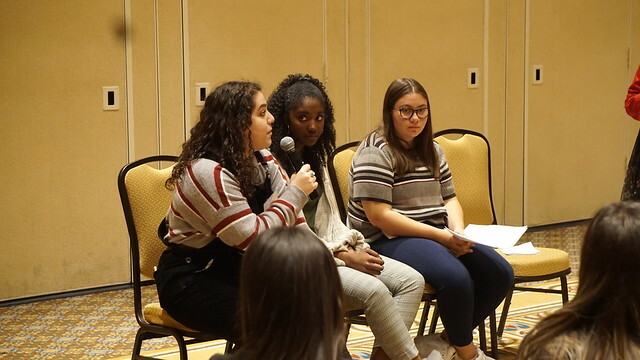 Composed entirely of young people, ages 15-18, the JAEC Youth Advisory Board guided a collaborative effort to plan the conference agenda, design break-out sessions, and deliver opportunities for attendees to explore the potential of student-centered learning and develop culturally responsive curriculum. And yet, youth are rarely granted access to the spaces where decisions about their welfare and development are made, let alone invited to contribute to these conversations. Beyond enlisting young people to plan and present JAEC 2018, for the first time in the conference’s history, young people were invited to attend the conference free of charge, thanks to funding support from APS. Throughout the day, Young attendees were positioned as experts with valuable insights, while adults were invited to ask questions, listen, and learn. This year's JAEC explores the principles, practices, and potential of creative youth development (CYD), a recent term for a longstanding theory of practice that integrates creative skill-building, inquiry, and expression with positive youth development principles, fueling young people’s imaginations and building critical learning and life skills. We are pleased to announce that Nicole Amri and Jon Hinojosa of San Antonio's award-winning youth program SAY Sí, will provide the keynote addresses at JAEC 2018. Attendees will also hear from Thameenah “Ty” Muhammad, a Phoenix-based performer, teaching artist, and member of the JAEC 2018 Youth Advisory Board. Every two years, the Arizona Commission on the Arts and Arizona Department of Education co-host a Joint Arts Education Conference (JAEC) with arts educators from all disciplines. This year, the co-hosts have enlisted a highly qualified cohort of experts on creative youth engagement strategies to lead the planning and presentation of JAEC.